If you're not familiar with Batista, we'll he's one of the most popular wrestlers now in World Wrestling Entertainment. 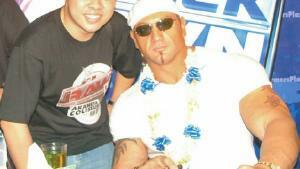 Batista was scheduled to visit Manila for 2 days to promote the upcoming Smackdown Manila Tour set for October 2006. Out of the 5 malls he'd be touring, I picked the one least likely to have lots of people and on a weekday. I was with my former officemate EO and we were lucky to get in because we already had tickets for the October event. To make our experience even more exciting, both of us were two of 10 lucky texters who won a special official WWE matt and an exclusive opportunity for a meet and greet up close with the Animal. The whole experience was so surreal and for this day in particular, I was a fan and not a media person covering the event. I was also nervous as what I could say to Batista since there was only a 15 second chance each winner got since they were rushing the event. I clearly remembered I told him "I admire the fact that you acknowledge your Filipino heritage." Ehhhh !!!! Wrong answer ! I don't think he heard me cause of the noise plus the fact the I wasn't able to finish my sentence or else I would miss the photo opportunity. I should've just said "Hope you become champ again !" ... at least it would be short and sweet. Damn he's huge ! His shoulder is as hard as a rock and his arm is as big as my puny thigh. His thigh is huge enough to be my friend's waist ! The 3 hour wait was worth it. I got my autograph and pic. (Note: I intentionally cut the pic to hide my useless identity. hehehehe!) This is the closest I've gotten to an actual international wrestler. Whooooohooooo !!!! Batista ! Batista ! wow your so lucky ..
galing naman nameet mo si batista personally.. yan ang inaabangan ko noon dito sa italy kaso ang nameet ko lang na wrestler eh si randy orton.. how sad pero okay na din..